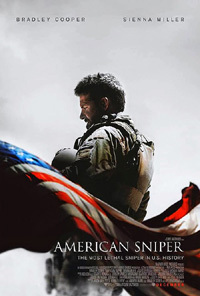 American Sniper is based on the military (and sometimes home) life of the country’s “most lethal sniper”, Navy SEAL Chris Kyle. Kyle can be seen as your textbook American – growing up in Texas, riding rodeo, hunting from a young age, and joining the military. Excelling in sharp shooting, after gruelling training he is deployed to Iraq. While this is not a sniper in the indiscriminate assassin sense of the word (although that can be debated for weeks if one looks at the justification of a military occupation…), but rather the job of covering a military patrol and taking out targets attacking or ambushing the soldiers, convoys and other manoeuvres, people setting IED's and so forth. Countered with his wife and kids back home, it looks at duty, patriotism and difficulty to adjust (from a USA perspective). The viewer is taken through several tours of duty, and his very first targets cannot be more controversial - a woman and a child (both allegedly attempted to hurl a bomb at a patrol). The opposing point of an enemy sniper / rival doesn’t really give the other side of the story, merely reflecting that it’s a war of two halves, with casualties all round and collateral damage stuck in between losing most – and (in addition to Kyle's squad trying to find "The Butcher") serves as a target he’s driven more than any other to eliminate. On its release this sparked vigorous debate of it being a propaganda film, with as many defenders of the movie and the memory of its subject as its attackers (which also included Hollywood names like Seth Rogan, and more expected, Michael Moore). This is one of those movies you can’t just enter into without a pre-conceived notion (even though its makers claim they wanted to focus on a soldier’s struggle with his job). Platoon, Full Metal Jacket and The Hurt Locker did not set out to glorify the American war efforts, but here it very much waves the flag. On many levels it’s a “preaching to the converted” case - American “patriots” and fans of Kyle will love it and will solidify their (sometimes blind) support of the troops (like our Fox News friends), feeling they’re out there keeping their country safe from the enemy and can do no wrong – while those who feel the USA has no business butting into other countries will despise it. In the film’s wake, many disturbing anti-Middle Eastern messages on social media took flight, having many fear this movie is an incitement of American aggression. Some felt strong enough about the film resulting in spraying “Murder” on billboards of the movie poster. The film also attempts to address PTSD, but it comes across more as glorifying one man as a hero than the wider, distressing issue of war screwing up those who get sent off to kill, get maimed and return a shell of their former selves. In a post 9/11 world Americans will view this movie in a different (more personal) way than we would, just like South Africans perceive a film with local roots like The Long Walk To Freedom in a different light to that of an American. Actor Bradley Cooper has become quite the screen A-lister (in the wake of the lad Hangover series), also acting as co-producer on this movie, and earning another Oscar nomination (which he lost to Eddie Redmayne in The Theory Of Everything). Except for Best Sound Editing, it lost out on all its Academy Award nominations, including Best Picture. Director Clint Eastwood has starred in and made quite a few notable movies across his expansive career, but somehow I can’t seem to see him in the same light as before, after his pathetic Republican convention empty Obama-seat rant… and it appears as though the adoring Hollywood view of him as an American film icon may have done the same. Even so, while it had its plus point and many lows, there was no way this movie could’ve won the big prize. Then a completely different debate sprouted around the rubber baby scenes – the very obvious fake baby distracting many from the scene’s communication between husband and wife. But, in the world of making movies you sometimes need to make difficult decisions and use tools at your disposal – never mind the fact that most bullet ricochets & blood splatters are digital. A few years back Kyle was shot and killed by a fellow soldier he took to the shooting range (as part of his assistance to rehab veterans). As I wrote this, the news reports had Kyle’s killer Eddie Ray Routh on the stand, a very swift trial finding him guilty of murder. The real details behind it is still hazy (with CIA conspiracy theories also afoot), but the irony of it all, beyond the fact that Kyle was killed by one of his own, is the PTSD many men suffer when returning home could have played a role in this incident (evidence of Kyle and his friend’s sms’s in the car on the way to the shooting range talking about how far gone this guy seems). For anyone with an opinion on war and American involvement in the Middle East, the subject matter of this movie would make it very difficult to enter into for mere entertainment.